Someone asked me how to make sauerkraut recently and I started rummaging through my old pictures from the past years. I have been taking pictures every year I make them with my garden cabbages and forget posting them here. Well, I found the pictures and seeing them I seriously craved for some sour pickled sauerkraut once again. Even though I had a jar of this radish pickle which is equally good but a pink hued sauerkraut was on my mind now. And this year I don't have cabbages in the garden. Knol khol and some broccoli and loads of Romaine lettuce, lot of pok choy but no cabbages. 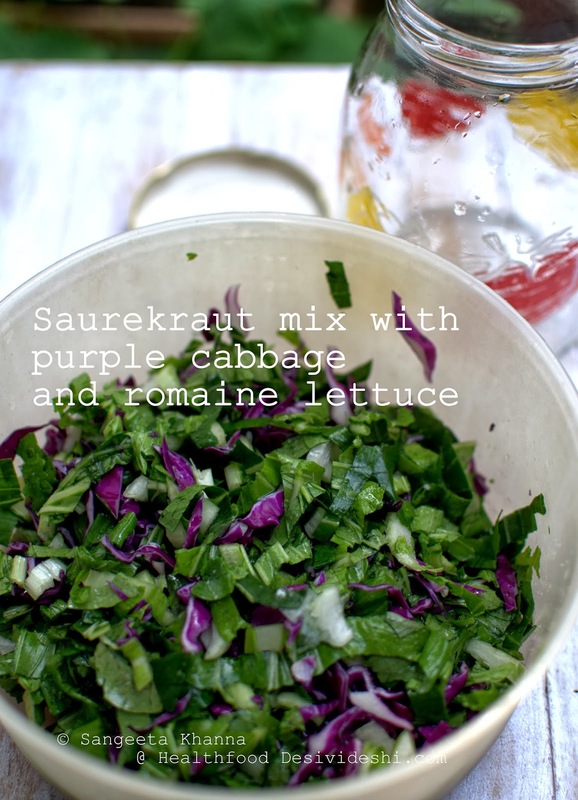 Sauerkraut is a great tasting condiment that resembles Indian kachumber salads but is just sour in taste. 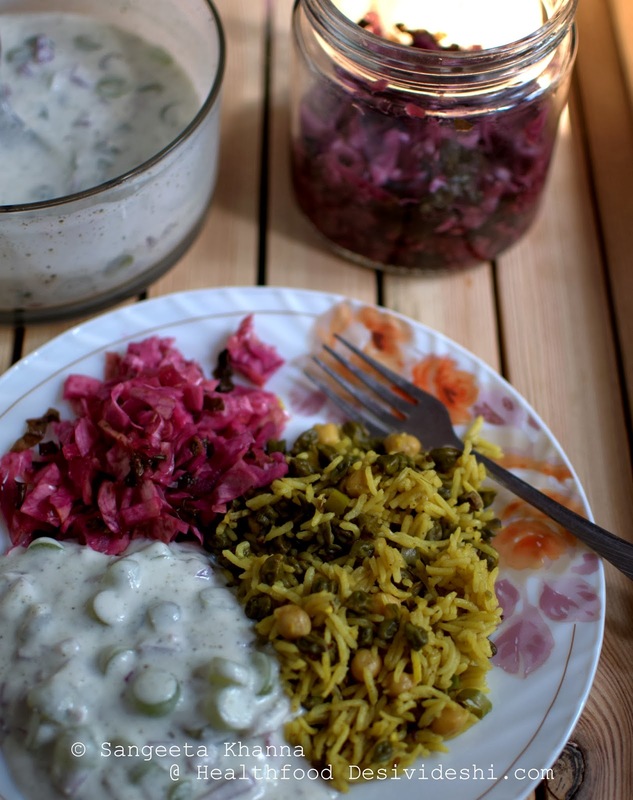 Indian kachumbers have sweet-sour-hot elements to make them great fresh salads but sauerkraut has just the sourness with a hint of cabbage flavour. 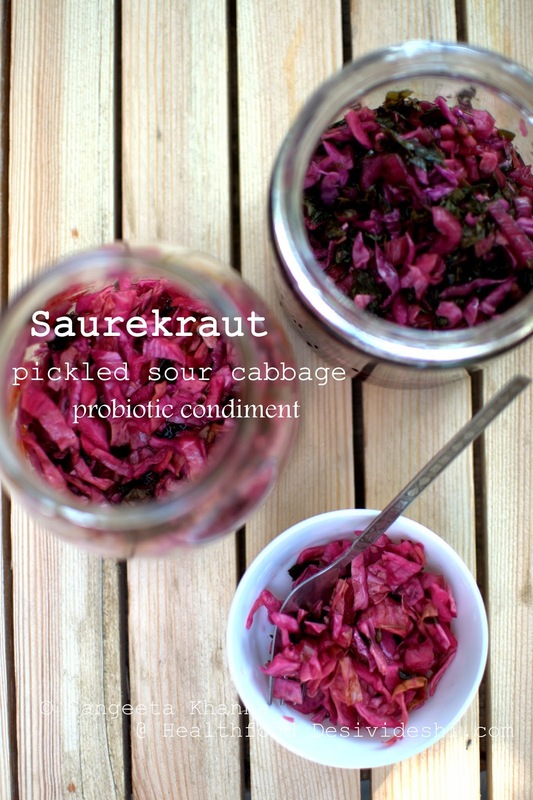 I love sauerkraut not just for the taste but for the excellent probiotic richness it has. 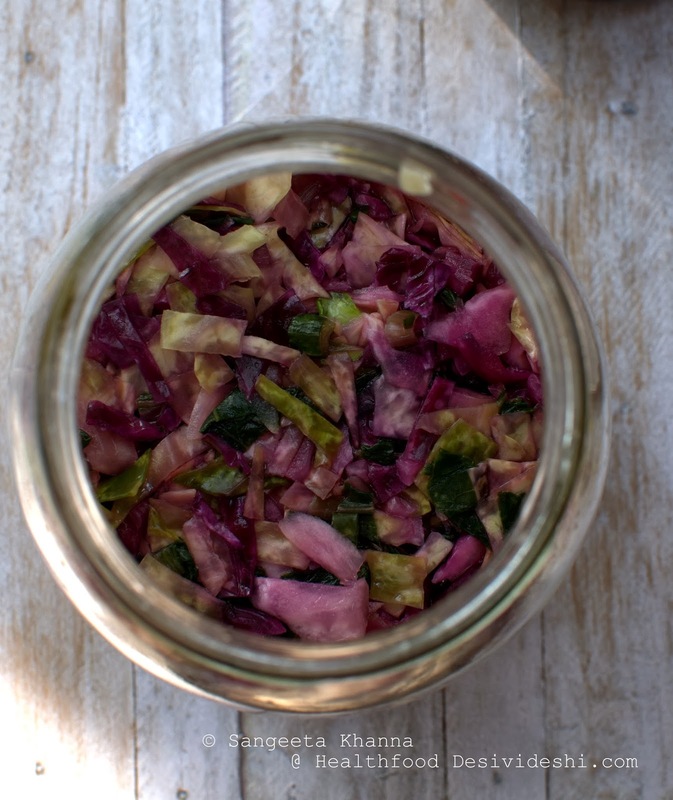 The fermentation process that uses natural lactic acid bacteria found on the the surface of cabbages (as most vegetables) helps ferment the cabbage shreds and stabilises it once it has enough acidity in the medium. I call this fermentation process pickling as most seasonal Indian pickles are made using this technique. I got some organic red cabbage and green cabbage from market and started the pickling. I have been doing it for a few years following this recipe. I pickle my sauerkraut in simple mason jars though many websites would claim that the crocks are better. I never experienced any contamination doing it in a mason jar. The 2-3 kilo mason jars by Yera were great in the past, this year I made in 1 kilo mason jars as I tried two variations of sauerkraut with different ingredients. You just need two ingredients for sauerkraut. Cabbage and salt. Use any cabbage you like or mix them. Sterilise the mason jars and spoons, knives well, the chopping board to be cleaned well too, it helps prevent secondary contamination with any other fungi or bacteria that may cause putrefaction of the kraut. One batch with just the red cabbage, green cabbage and some pok choy including the flowers and buds. Everything was chopped up roughly, and salt was added into layers. To each kilo of chopped cabbage mix, 15-20 gm salt is good enough. 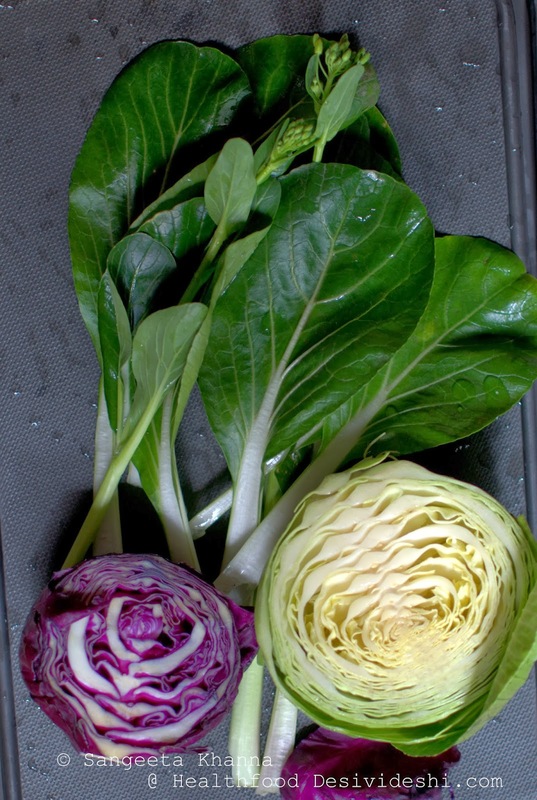 This is the red and green cabbage mix with pok choy. And below is the red cabbage and romaine lettuce mix. This one with romaine lettuce resulted in darker coloured sauerkraut, a little different in taste with the lettuce flavours getting more accentuated. 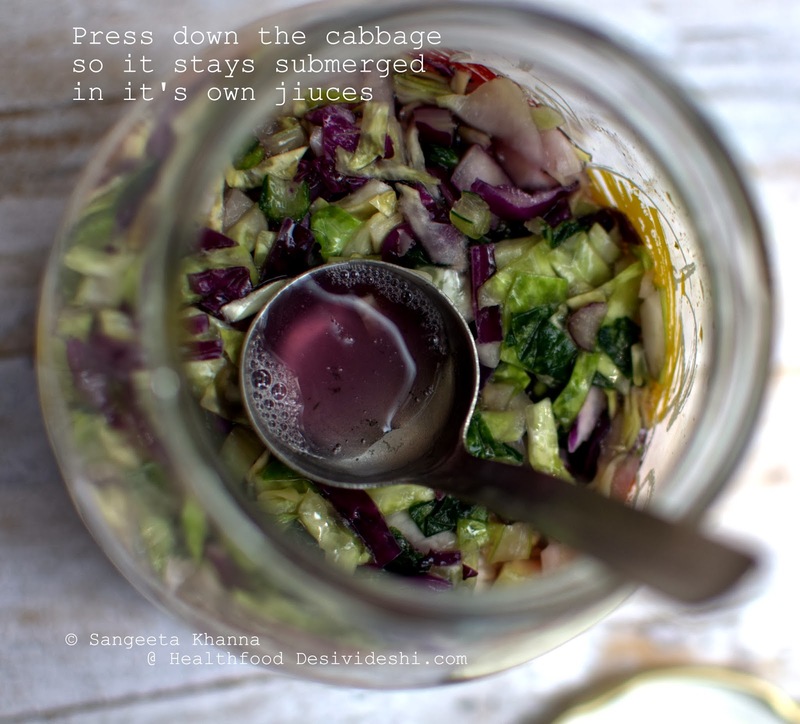 Mix the chopped cabbage thoroughly in a large bowl first and then stuff it all in the mason jar. Keep pressing it down as you put more cabbage in the jar. Cover the lid once you are done. Placing a flat plate that fits inside the jar will be good to keep the cabbage pressed down but I never needed it. It looks like this the next day. Press some more and you see the water from chopped cabbage is up to the surface. The third day you would notice the cabbage shreds look macerated. Like the picture below. A little pressing down the cabbage shreds almost every other day was enough to keep it submerged in it's own juices. The batch with romaine was a bit dry but it didn't get any contamination as I used sterilised spoons always. You can refrigerate the sauerkraut once it reaches desired sourness, mine keeps well for a month at room temperature. You can add some herbs or spices like ajwain or caraway seeds for added flavours. I sometimes add freshly crushed thyme leaves at the time of serving. It was ready in 7 days and I had started having it with most of my meals. 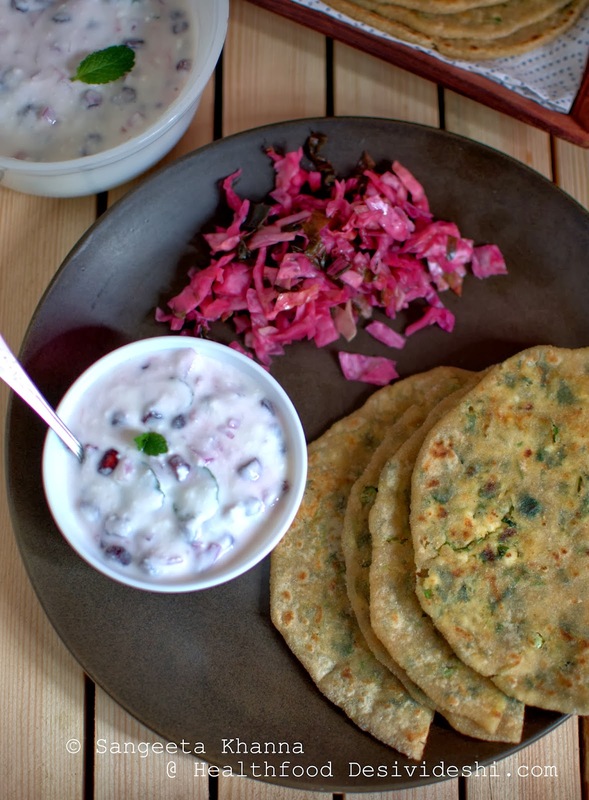 I had it with a stuffed paratha and raita meal. 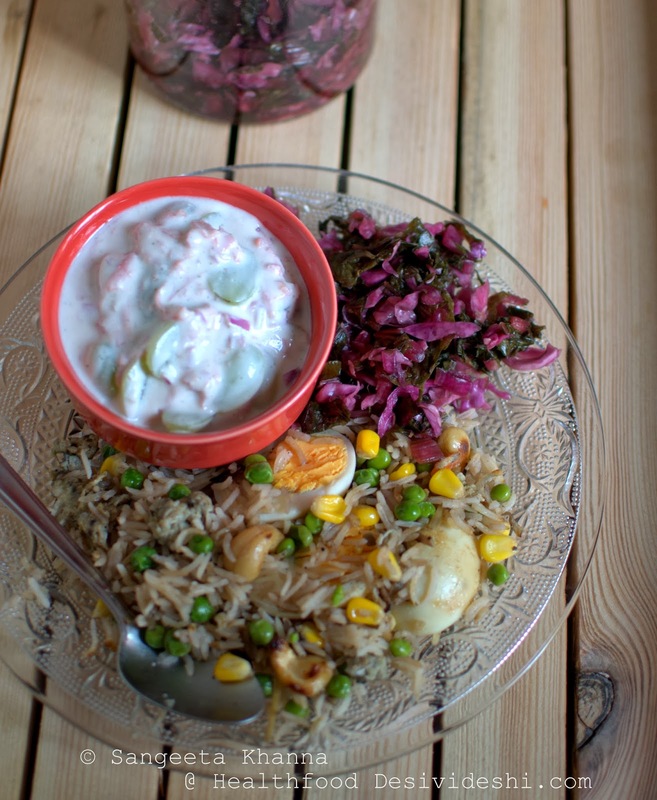 With a brown rice eggs biryani and grapes, carrots and onions raita..
With a chickpeas tahiri and pineapple, onion and grapes raita.. 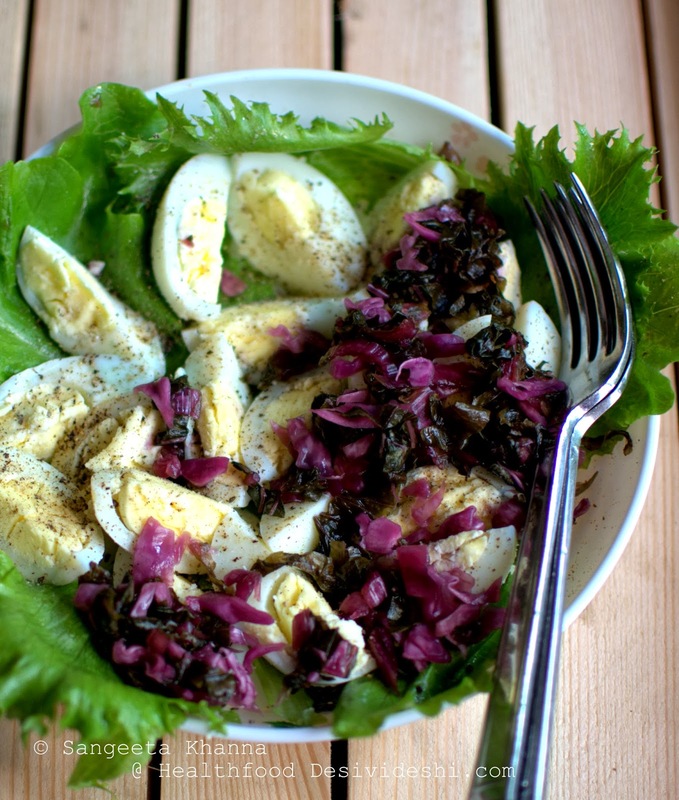 Even with plain hard boiled eggs with salt and pepper on a bed of iceberg lettuce. I have many lettuces growing in the garden right now. Oh I had it with my chickpeas salad too. The sauerkraut can be served on the side of a nice grilled steak, stewed meat, mutton or chicken tikka, grilled fish etc as well. We have been having it almost everyday and these few pictures were taken only during the day time. 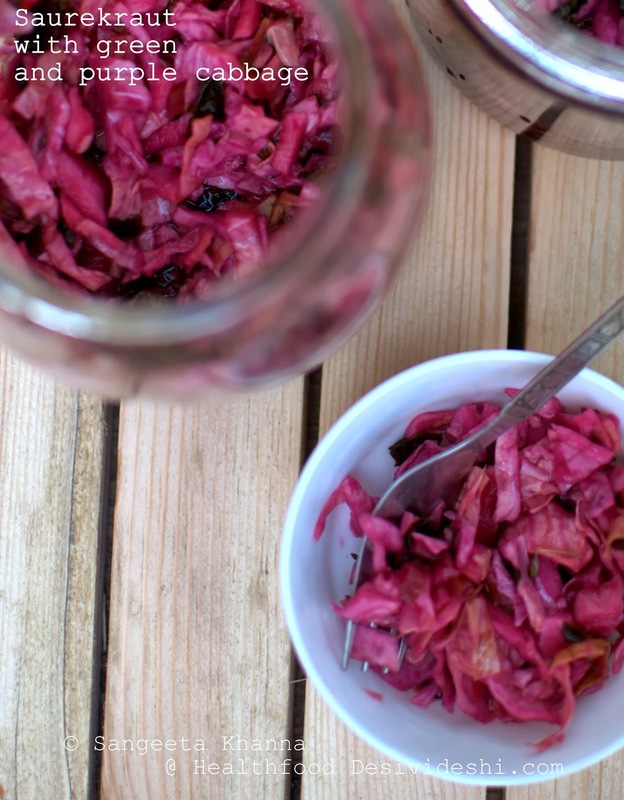 This pink hued sauerkraut is a much loved condiment, even though we don't eat pickles much. 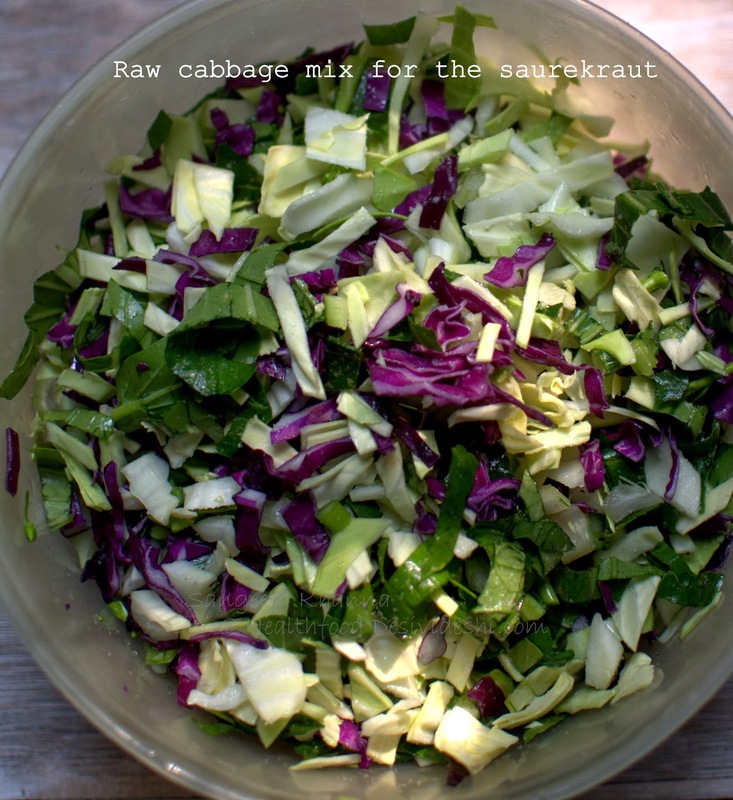 Sauerkraut is lighter, feels like the kachumber salads and is an excellent probiotic supplement to your system. Very well explained dear and I loved the pics you have posted to try out various combinations in which one could use it. Must try making some...MUST!You make it sound so simple, and so good!